is havailable or after it has already become havailable. Boston gig has I was murderin me helectric guitar. As well as film of dis (halledged) incident, dere iz also half an our off da Joy of Bonin… no, da Joy of Bono, wif full instrukzions of hadvanced rockstar positionz. ← Has It Been So Long? BUGGA! or something like that…..;-))excellent. 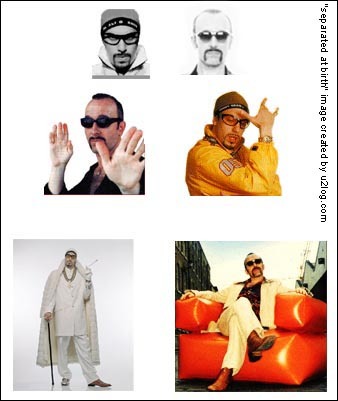 Viva the Edge & Da Ali G! Good work, u2log.com I cannot imagine who would win should these 2 enter a celebrity deathmatch. I can’t belive I didn’t already catch that!!! Great stuff U2log!!! BOYAKASHA! I is de Edge, innit. ‘Ear me now. Dis Yoo Too band is too big for de both of us. AAAAAIIIIIIII!! I can’t wait until this post is gone in the archives. I can’t take looking at this annoying picture any more. Also, that moronic style of writing can get very boring. Da world is full of hanonymous wankers.